This e-bulletin, being initiated by "Pakistan Project" at IDSA, seeks to focus on major developments in Pakistan and bring them to the attention of strategic analysts and policy makers in India on a weekly basis. It will carry a lead commentary on the most important development during the previous weeks, followed by useful information on the evolving political, economic and security situation in Pakistan. 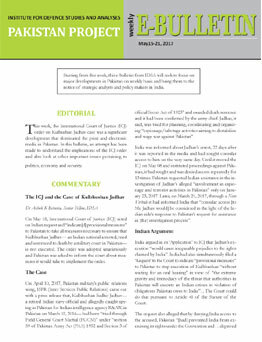 November 27-December 3, 2017 - The confrontation between the executive and judiciary: What does it means for Nawaz's Future? October 16-22, 2017 - The End of the Nawaz Era? October 9-15, 2017 - Is Army Expanding its Role in Pakistan? September 4-September 10, 2017: Will BRICS Declaration Bring about a Change in Pakistan's Approach to Terrorism?